What do tap dance and rap dance have in common? How can a handmade object drive a new wave of mass consumption? Why are today’s modern cities evolving into medieval towns? One cliché cited time and again is that history repeats itself. That might be why the world we live in today is one massive sampling of current events, fictions, histories, legends. Reading future trends requires recognizing the complexity of this daily reality. 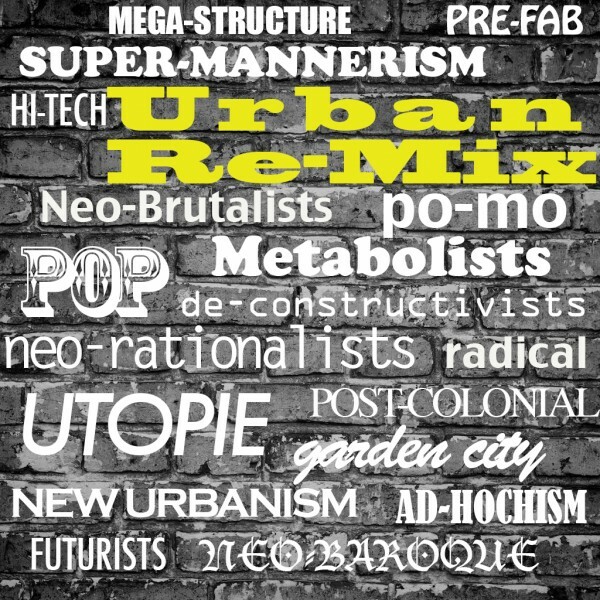 “Re-Mix” can be seen as a manifesto on the recycling of everyday experiences, from secondhand clothing to politically radical ideologies. History becomes a deep resource for exploring the present: icon paintings and comic books, baroque theater and 3D cinema, Paxton’s Glass Pavilion and the Pompidou Center are part of a continuous yet jump-cut stream of innovative cultural developments. The History/Theory Seminar( plus Workshops) will focus on the study of specific contemporary urban-based case studies, with the goal of expanding our knowledge on the evolution of the city. The Advanced Seminar/Workshop uses an array of critical approaches that include theory based analyses and multi-media documentary techniques to produce original project reports. 30 credits: FALL: 15 credits: SPRING 15 credits. Includes 2 Research Workshops scheduled for the Fall and Spring semesters. Post Graduate or equivalent. This course is designed specifically for advanced post-graduate individuals (and PhD students) interested in developing research based projects focusing on urban culture. The course introduces critical research methodologies and critical writing skills, as well as diverse formats in multi-media representation useful for developing comprehensive publication/documentary/curatorial projects. The course is also suitable for professionals in the fields of arts, design and architecture interested in pursuing a theory based practice. The course’s overall goal is to critically observe and creatively respond to newly emerging social trends taking shape in today’s cities and urban peripheries. Students will be presented an overview on the modern evolution of the city and introduced to methods in history/theory as well as techniques in representation and multi-media communications. Each student will be required to develop a unique research case-study identifying and documenting a subject related to recent social transformations effecting today’s cities. Each case-study is to be closely associated with a specific physical context, such as a neighborhood (urban, or peripheral), a specific landscape (industrial archaeological, informal settlements, entropic regions or abandoned territories), or object based (part of the human artifactual or material environment). These case studies can be drawn from a range of global locations. Fall semester will focus on identifying a suitable long term case-study for each of the participating students. The first semester concentrates on historical precedents, comparative readings and discussions on weekly themes. The semester also presents critical methodologies intended to guide the first phase of research and documentation. The Fall Semester Workshop will be organized to provide an immersive experience introducing a real world project together with internationally recognized professionals and practitioners who will work collectively with the students on realizing a specific production based research project during the period of the Workshop. Spring semester will focus on methods of critical analysis, including constructing a critical argument using different forms of writing and hypertextual narratives, visual and graphic analyses, mapping and diagraming techniques, as well as mutli-media communications platforms and digital applications. The final objective is to format the research document into a publication, video documentary, (including diverse digital platforms), experimental storyboards, animation processes, event based or performance based productions, and installations or curatorial projects for site-specific locations. The Spring Semester Workshop will be organized to bring together a pool of experts with students in a seminar environment to discuss the student case-studies to encourage feedback, and critical exchange. The student should be able to understand and employ diverse methods of critical research on topics ranging from history/theory to globalization and post-colonialism while adhering to the highest standards in ethical judgment and academic fairness. The student will acquire advanced skills in expository representation and multi-media communications to present complex concepts through graphic forms of representation including mapping, diagramming and other multi-media forms of expression. The student will experience and become familiar with communicating complex projects, in different publication formats, including blog posts, exhibitions, site specific installations and the choreography of event spaces. Finally the student should be able to design, develop and lay out a publication, either in a digital or in a print medium for his or her final project. Seminar/Workshop User manual: the Seminar meets two times a week, two weeks per month. The two weekly meetings are composed of alternating sessions: Talk Sessions and Blob Sessions. “Talk sessions” focus on the study of urban history/theory, based on assigned readings. The “Blob sessions,” look at dynamic forms of city culture as an evolutionary process. There are two weeklong Workshops scheduled for the Fall and the Spring Semesters, focusing on current practices used on documentation and Production. The course aims at building an understanding of the recurrent tendencies that shape the seemingly ‘unique’ episodes in culture over time, as well as an awareness of how apparently marginal differences between the localized effects of global culture can provide relevant data on their actual significance. As part of this, participants acquire actual (multi-media) skills developing re-mix techniques under supervision of invited artists, architects, and related experts with experience in these multi-disciplinary practices. Finally, though their active participation, students will understand how to relate these experiences to their own practice. These skills will be both theoretical and practice oriented, including overviews on cultural tendencies and signifiers, and participating students will be invited to speculate how their own (artistic, professional) work can incorporate the technical and conceptual skills explored in this course.